1 - THE START (car park, 'Col de Jou', above Casteil). We follow the path which is signposted for Mariailles and which has red-and-white waymarks. (The jeep track to Mariailles is below, on the right.)... In the forest, on the left ('Col de Creu'), is a viewpoint over the Cady gorge... The path narrows. 2 - Junction with the track to Mariailles (and a small car park). We go to the left and we follow a path alongside a small canal, still with red-and-white waymarks... The path climbs in the forest, steeply and in zig-zags... On a rocky ridge, we have a second viewpoint over the Cady gorge (and to the Tour de Goa)... The path descends a little. 3 - 'Col du Cheval Mort'. We leave the red-and-white waymarks. We cross a small canal and we climb a few metres. We meet a track. We go to the left, along the track... Junction with the main track which goes to Mariailles. We go to the left, along the track... On the track, we pass through the 'Randé' car park... We stay on the track as far as Mariailles. 4 - Mariailles. The main mountain refuge (with wardens) is on the left. At a junction of tracks (with a magnificent panorama in front of us), we follow a path on the right which again has red-and-white waymarks... The path descends... We cross two mountain streams. 5 - 'Col Vert'. The path turns to the right. We pass through a small metal gate... We emerge from the forest and we cross rocky scree slopes... We descend a little, towards the river. 6 - The Cady river (ford). We cross the river. The path turns to the left a little. 7 - Bifurcation. We go to the right. Here, we leave the red-and-white waymarks and we follow yellow waymarks. 8 - 'Arago' (small mountain refuge), with a spring on the right. We go straight ahead... We cross a stream... The path winds across a small plateau... We see the Pic du Canigou on the left... The path turns sharply to the right. Here, the path begins a steep climb, in zig-zags... We pass a small spring (on the right). 9 - Junction of paths. (On the right, above, the 'Porteille de Valmanya'.) We go straight ahead... We cross rocky scree slopes. We follow carefully the yellow waymarks... On the right, the 'Brêche Durier'. 10 - The foot of the 'Cheminée', a natural stone staircase. We climb carefully the sloping rock face, using our hands at every step. We take care not to kick loose stones... Near the top, we turn to the left and we arrive at the summit. 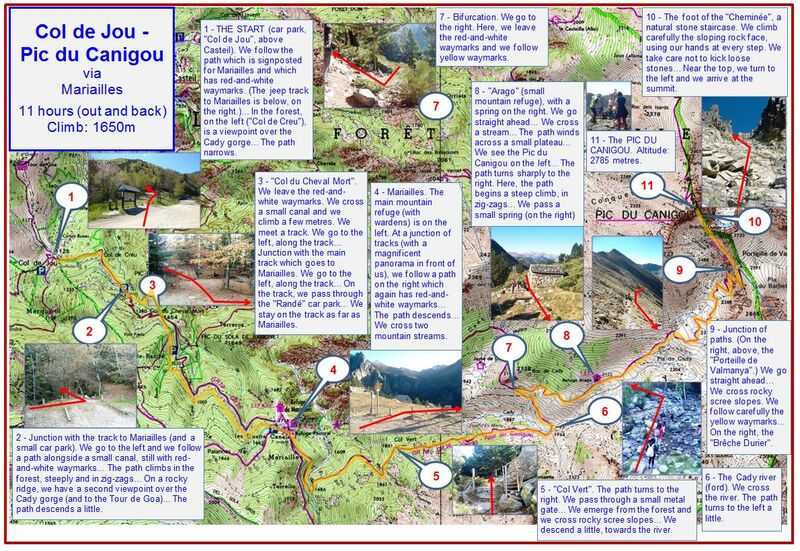 11 - The PIC DU CANIGOU. Altitude: 2785 metres. Note: in July and August, the jeep track between the Col de Jou and the car park at 'le Randé' is open to traffic. (In June, September and October, it is open as far as Mariailles.) However, the surface of the track is sometimes quite rough and the track can be unsuitable for vehicles without high ground clearance.